Zakir Hussain is an Indian tabla player, musical producer, film actor and composer.Zakir Hussain revolutionized the tradition of Indian percussion by uniting world music with forms such as jazz, fusion, and electronica. Like his father, Ustad Allah Rakha Qureshi, Hussain sought to bring the music of India to the international stage. "I don't feel that just because people listen more to Western music, it means a dismal future for the tabla," said Hussain in an interview with G.A. Rizvi. "One should listen to all kinds of music." Such a sentiment has not only made the consistently brilliant and exciting performer a phenomenon in his own country, but also inspired Hussain to experiment with the music of other cultures. Thus, in addition to remaining a favorite accompanist for many of India's greatest classical musicians and dancers, from Ali Akbar Khan and Ravi Shankar to Birju Maharaj and Shivkumar Sharma, Hussain stretched his talent to the Western world and Asia through numerous unique and historic musical journeys. His credits include recordings with George Harrison, Joe Henderson, Van Morrison, Jack Bruce, Tito Puente, Pharoah Sanders, Billy Cobham, the Hong Kong Symphony, and the New Orleans Symphony. His collaborations include work in the groups Shakti, the Diga Rhythm Band, and Planet Drum. Hussain also proved himself successful as a bandleader with his own ensemble, Rhythm Experience. The sound of the tabla--comprised of two hand drums pitched high (dayan) and low (bayan) and invented in the thirteenth century by Amir Khusrau--rang in the ears of Hussain literally all of his life. Born Zakir Hussain Allarakha Qureshi on March 9, 1951, in Bombay, India, he was the son of virtuoso Indian percussionist Ustad Alla Rakha Qureshi, generally regarded as the greatest tabla player of the twentieth century and longtime collaborator of Ravi Shankar. Allah Rakha, who died in December of 1999, was also responsible for moving the position of tabla players, or tabliyas, to a modern concert setting. Hussain was seemingly predestined to uphold his father's traditions, initiating his own training into the rhythmic complexities of Indian drumming long before he could sit or speak. "When I was a baby, my father used to hold me in his arms and sing rhythms in my ear," Hussain recalled in a conversation with Richard Henderson for the Wire. "He would sing these rhythms to me and by the time I was three or four, in my subconscious mind, these patterns and the sounds of this language were swirling about. I didn't have to learn the vocabulary of the language or the grammar of the tabla to be able to execute patterns on it. The knowledge was already there. As a child grows up listening to his or her parents' talk, that language is already there in the mind when the time comes to finally speak. The same was true of the tabla for me. The implant was there and my mind had taken it. By the time I was seven, I was playing concerts." Mastering the major schools, or ghanas, of the tabla under his father's tutelage, Hussain, by age 12, had already accompanied many of the master musicians of northern India and commenced his own concert career. Throughout his teens, the young prodigy continued to thrill critics and crowds alike. However, as Hussain approached adulthood, many started questioning his abilities. "I could do no wrong between the ages of 12 and 17," he admitted to Henderson. "But suddenly, they wanted me to be a mature tabla player of 30 years, because they had seen me do the same thing as a young child. I did the same performances. I hadn't branched out or gone into areas where none had gone before. So I was getting criticised: 'Where is he going? We don't see the next step.'" Ready to escape the criticism, at the age of 18, Hussain took over his father's job as tabla player for Ravi Shankar for a tour of the United States, making his American debut in 1970. Afterwards, the master sitar player recommended Hussain for a teaching position at the University of Washington at Seattle. Here, Hussain immediately came into contact with music he had never heard before, including Middle Eastern, Arabic, African, and Asian music. "In India, we were so isolated, we had no idea that other traditions, equally old and refined, existed elsewhere in the world," he told Henderson. "At the university, I was suddenly hearing Chinese and Japanese classical music, Korean, African, and then I came in contact with jazz and Western classical music. The three years that I was there helped build a healthy respect for other music within me." Even though Hussain had a tenured position in Seattle, he decided to leave when Ali Akbar Khan offered him a job at his college in San Rafael, California, near San Francisco. Here, he met his wife Toni, a skilled kathak dancer, as well as Grateful Dead drummer Mickey Hart. In an effort to learn more about Indian percussion, Hart had initially sought out Alla Rakha, who, in turn, pointed the American drummer in the direction of his son. Soon after their first meeting, Hussain and Hart began working together on their first collaboration, Rolling Thunder, in 1974. Other projects followed over the years, including the albums Diga Rhythm Band in 1976 and Planet Drum in 1992, which won the Grammy Award for Best World Music Album, the Down Beat Critics Poll honor for Best World Beat Album, and the NARM Indie Best Seller Award for World Music Recording. During the 1970s, Hussain also performed and recorded with British guitarist John McLaughlin, with whom he founded the ensemble Shatki in 1974. The two first met when McLaughlin, interested in learning about North Indian vocal music, came to see Hussain while the tabla player was holding a workshop at the House of Musical Traditions in New York. Although Hussain was not a singer, he did have to learn the style in order to properly accompany vocalists. Thus, he agreed to give the guitarist his first Indian vocal lesson. A little later, back in San Francisco, they decided to form the group together. Shatki, which also included violinist L. Shankar, toured and recorded until 1978 when they disbanded. In 1999, however, Hussain and McLaughlin formed a new version of Shatki for a tour and subsequent album titled Remembering Shatki. Other notable collaborative efforts include participation on Pharoah Sanders' 1998 album Save Our Children, which featured Hussain's vocal recording debut, as well as the 2000 electro-percussive project Tabla Beat Science: Tala Matrix. Produced by Bill Laswell and co-starring Hussain, Ustad Sultan Khan, Trilok Gurtu, and Talvin Singh, the album illustrated how the sounds of the tabla could work with techno and jungle rhythms. As a bandleader, Hussain released his first album, Making Music, in 1987, followed by an album recorded with his father, Tabla Duet, in 1988. That same year, Hussain became the youngest percussionist ever to win the title "Padma Shri," an honor bestowed by the Indian government to civilians of merit. Then, in 1990, he received the Indo-American Award in recognition of his cultural contribution to relations between the United States and India. In April of 1991, Hussain earned another important honor, the Sangeet Natak Akademi Award, presented by the president of India and the country's governing cultural institute. Highly regarded in the United States as well, in 1999, Hussain received a National Heritage Fellowship, America's most prestigious honor in the traditional arts. In the early 1990s, Hussain established the Moment! Records label for the purpose of releasing original works and collaborations in contemporary world music, including the compositions of his own percussion ensemble, the Rhythm Experience. The label also offers live concert recordings of performances by great masters of traditional Indian classical music. Besides his accomplishments as a leader, collaborator, and label owner/operator, Hussain has also worked in the film industry, enjoying a longstanding relationship with the Merchant/Ivory filmmaking team. For Merchant/Ivory, he scored original music for films such as In Custody in 1993 and Heat and Dustin 1985. With the latter project, Hussain also played Julia Christie's love interest on screen. In 1983, he received an award nomination at the Cannes Film Festival as composer and music director of the film Heat and Dust. He starred in several films specifically showcasing his musical performance both solo and with different bands, including the 1998 documentary "Zakir and His Friends", and the documentary "The Speaking Hand: Zakir Hussain and the Art of the Indian Drum" (2003 Sumantra Ghosal). He also performs in the DVDs The Rhythm Devils Concert Experience (2008), and The Way of Beauty (2006) with the band Remember Shakti. 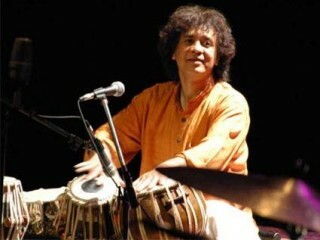 Moment Records’ 2006 release Golden Strings of the Sarode, with Aashish Khan and Zakir Hussain, was nominated for a Grammy Award for Best Traditional World Music Album category for that year. -Sangam (2006) - Jazz collaboration with bandleader Charles Lloyd.